Master the proven, effective intervention techniques for rageholics! A direct, three-step approach (the ABCs) to resolving anger in men. The Anger Resolution Therapy Certification™ Training Home Study is invigorating, fun and provides step-by-step training, certification and marketing tips. It includes examples of actual interviews. Learn the individual interview and group approaches to maintaining control of the session and preventing conflict from erupting in your office. Expand in a market niche for managed care or fee-for-service clients. Build your practice by serving women who have lost their tolerance for rageful husbands and are seeking professional help from a therapist. Obtain certification that shows your competence in working with rageful men. The CART certification creates a powerful credential that shows your dedicated advancement in your career. 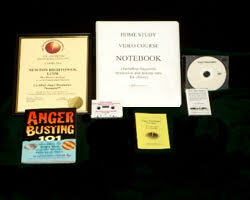 *Note that more than half of the therapists certified to date as Certified Anger Resolution Therapists™ are women. 15 CEU’s are available through all Texas Boards (Psychologists, Social Work, Licensed Professional Counselor, Licensed Marriage and Family Counselor, Licensed Chemical Dependency Counselor, Psychiatrist…informal, and Nursing…Type II). Boards in other states will often honor CEU’s from other state boards. Please check with your state board.